Driven by a strong move towards sustainability, vehicle body design is going through a radical change. In response to this, Axalta Coating Systems, a leading global supplier of liquid and powder coatings, has been looking at ways to meet the challenges that these new lightweight materials are presenting. Increasing pressure from regulatory bodies has been put on the automotive industry to move towards more sustainable materials and processes. Over several decades, regulatory requirements, such as reduction of organic solvent emission, overall carbon dioxide reduction and increased fuel efficiency, have prompted the coatings industry to develop new, ecologically sustainable coatings, like high solids or waterborne materials, and consolidated systems such as primer-less, two-wet or three-wet systems. In order to reduce the overall weight of the car body, the OEMs want to increase the usage of lower-weight materials, including aluminium and magnesium and polymeric substrates (such as carbon fiber). Paint shop processes and materials need to be adapted accordingly. In the case of polymeric substrates, the baking temperatures for the coating hardening processes need to be lowered. The lightweight materials help to cut down CO2 emissions in the paint shop, as energy consumption can be reduced when using low-bake materials. These materials also offer enhanced styling capabilities due to new opportunities in part and vehicle geometry. The possibility of on-line and in-line coating of body and plastic parts means there is an opportunity to improve colour harmony and to simplify the supply chain complexity. Of the various paint technologies feasible for low-bake systems, each has advantages and challenges. With UV curable systems, the bake window can be brought down to ambient temperature, but there can be problems from radiation shadow zones. These may be avoided by mounting UV lamps on robots that can reach all areas and ensure proper curing. This solution could be used in combination with a three-wet or primer-less waterborne system, offering the opportunity to reduce overall clearcoat oven length by up to 70 percent. Other crosslinking technologies, such as 2K epoxy acid, 2K acrylic/melamine with unblocked catalyst or 1K acrylic/melamine with blocked catalyst, have the potential to reduce bake temperatures close to the target but can have other issues, such as stability or technological properties with these curing conditions. So far, the leading cross-linking technology for low-bake coatings is 2K polyurethanes. Last but not least, there is another challenge in lowering the curing window for electrodeposition coating, as there will still be significant metal components in future body design. The route to lower bake ED coatings can be described in three developmental stages. The first is a target bake of T max on the exterior at 180 degrees Celsius (365 degrees Fahrenheit), which would mean minimum required temperatures of 165-170 degrees C (329-338 degrees F). This could contribute to energy reduction in the paint shop. Axalta has had positive results based on current commercialised Aqua EC4027 technology with which it has achieved good solvent resistance and corrosion results down to 10 minutes at 150 degrees C (302 degrees F). The next stage in development could reach the temperature area (T max = 140 degrees C/284 degrees F) enabling on-line coating of specific plastic parts – in other words, metal and plastic pasts can be run through the ED bath and top coated on-line. Here there is the need for new cross-linking chemistry and a significant development of process and materials. The issue of higher temperature requirement for bake hardening steel would also need to be addressed. The potential benefits of a further reduction of ED baking temperatures, down to 80-125 degrees C (176-257 degrees F) for instance, would need to be proven – this would, however, be a longer term development process. Lightweight body design will inevitably drive further innovation in the area of low-bake coatings, materials and processes. And while some technology is already available, more is being developed that will address the challenges that the new materials present. The critical next step will be further integration of single solutions – materials, processes and application – in real mass manufacturing environments. 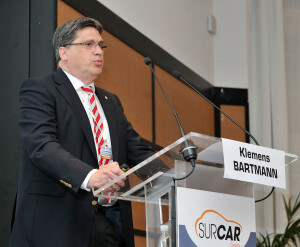 Bartmann is global director of OEM technology for Axalta Coating Systems. Details: www.axaltacoatingsystems.com, @axalta on Twitter and Axalta on LinkedIn.